The nitric oxide derived from arginine is directly or indirectly implicated in practically every cellular response and health condition imaginable, from the cardiovascular system to the immune system, and hormone function to nerve function. Although an exhaustive list of possible applications for the amino acid is not included here, the following are the primary scientifically backed reasons that anyone – even healthy people – should consider adding the arginine to their health and wellness regimen. There are several flavors and formulations for sweetness too. Each is designed to acommodate your specific tastes ans needs from diabetics to vegetarians. There are Jumbo sizes and single-serving tak on-the-go packets too. ProArgi9 Plus is one thousand times more powerful than any naturally occurring antioxidant in the body. Arginine`s antioxidant properties support various body system and may protect against heart disease, stroke, cancer, and diabetes, as well as slowing premature aging. ProArgi9 Plus offers wide-ranging cardiovascular support, including controlling blood pressure and plaque formation. Nitric oxide keeps arteries relaxed and pliable for normal blood pressure, preventing hypertension and angina. ProArgi9 Plus enhances memory, particularly long-term memory, and may help to reverse the effects of dementia and Alzheimer’s disease. ProArgi9 Plus boosts human growth hormone (HGH) production, which has anti-aging properties. 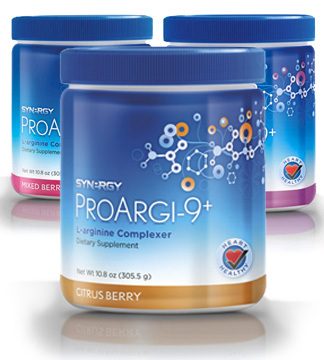 ProArgi9 Plus enhances communication of messenger cells between nerves and the brain. ProArgi9 Plus may help improve immune function and fight bacterial infections. ProArgi9 Plus may help in the treatment and prevention of diabetes since many disease complications, including poor circulation and blindness, are vascular in nature. Arginine is also found to regulate insulin secretion in the pancreas. ProArgi9 Plus may inhibit the division and proliferation of cancer cells. ProArgi9 Plus helps with cholesterol control by lowering serum and LDL cholesterol levels. ProArgi9 Plus anticoagulant abilities reduce clotting to lower heart attack and stroke risk. ProArgi9 Plus reduces pregnancy-related hypertension, a risk factor for both the expecting mother and the unborn child. ProArgi9 Plus is useful in the treatment of asthma by opening pulmonary pathways for easier breathing and the treatment of lung disorders. ProArgi9 Plus relaxes hypertonic sphincter muscles, preventing and healing hemorrhoids. ProArgi9 Plus boosts lean muscle mass and preserves bone density by encouraging HGH production, which also leads to a reduction in fatty tissue. Because af these properties, it may be useful in weight management and strength training. ProArgi9 Plus can help offset cardiovascular and lung damage caused by tobacco use, since nitric oxide levels in smokers are less than half of those found in non-smokers. ProArgi9 Plus helps to accelerate wound healing and post-surgery recovery. Research has shown it is useful in treating burn wounds and stimulates wound healing in the elderly. ProArgi9 Plus may be useful in enhancing athletic performance due to its ability to boost exercise tolerance, its beneficial effect on the lungs, and its effect on HGH levels. Which helps with building lean muscle tissue. ProArgi9 Plus may be used to improve the function of the prostate. ProArgi9 Plus may prevent and possible reverse the effects of osteoporosis by positively affecting bone mass. ProArgi9 Plus has been used in the treatment of irritable bowel syndrome and to reduce the occurrence of ulcers – especially stress related – without affecting gastric acid production. ProArgi9 Plus may improve renal function and slow the progression of renal disease and age-related chronic renal failure. Arginine`s protective effect on the kidneys may also benefit those with diabetes. *These preceding statements have not been evaluated by the Food and Drug Administration. This product is not intended to diagnose, treat, cure or prevent any disease.